0 is referred to as "Blank"
1 is referred to as "Ace"
2 is referred to as "Deuce"
5-6 is referred to as the "Trial"
6-6 is referred to as "The Dog!" 1. 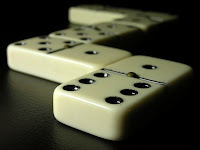 Count that there are 28 dominoes, from double blank to double six. 2. Place them facedown on the table and shuffle them until they're random. 3. Allow your opponent to take seven dominoes, and take seven for yourself. 4. Allow the player with the highest double to go first. 5. Lay a domino with like value next to the first domino (it doesn't matter which end). Make sure like values are always touching. 6. Pick from the pile if you don't have a domino that corresponds to the ones on the layout. Keep those dominoes concealed from your opponent(s). 7. Pass if no more dominoes are left in the pile. 8. Win the session if you're the first person to run out of dominoes. 9. End the session if everybody passes, in which case the winner is the person with the lowest score. 10. Count your score by the number of dots on the tiles remaining in your hand. 11. End the game if someone reaches 50 points in a game with two players or 100 points with three or more players. The lowest score wins.